Sometimes a soft drink is more than just a soft drink. Take the two titans of popular carbonated beverages – Pepsi and Coke. This is a funny, almost satirical film. Inspired by Jill Chen Louis’s book The Cola Wars, John Pilger’s Burp! 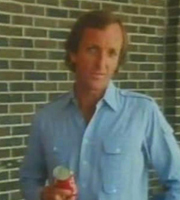 Pepsi v Coke in the Ice Cold War (1984) tells the story of the struggle between the ‘giants of carbonation and regurgitation, Coca-Cola and Pepsi-Cola’ – and how the two multinationals have influenced American politics.